Pardon Me For Asking: Have You Heard The Beautiful Sound Of St. Agnes' Carillon? Have You Heard The Beautiful Sound Of St. Agnes' Carillon? Have you been hearing St. Agnes' carillon in the past two days? The sound of the bells is absolutely beautiful. Today, they rang at the beginning of every hour in the afternoon. When I first moved into the neighborhood, it was not unusual to hear the carillon, but in the past few years, it has become a rare occurrence. 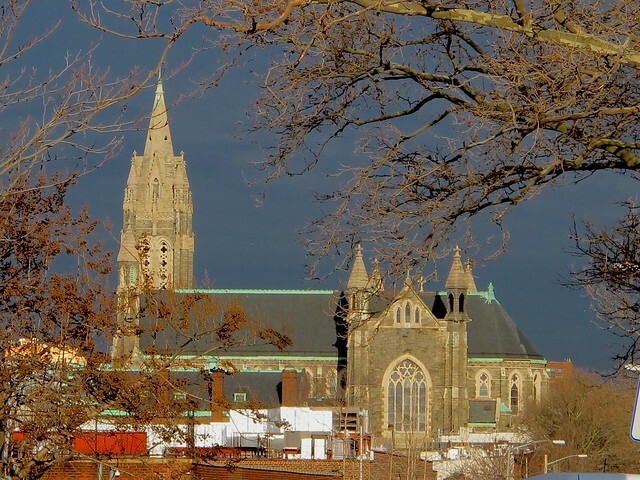 The impressive neo-Gothic Church at Sackett Street and Hoyt Street was designed and built by Thomas F. Houghton in 1904 to replace an earlier structure which was destroyed by fire in 1901. A real landmark in our neighborhood - and stunning pictures of it, Katia! Worried that the complainers that silenced the fake bells will try again. (They are a recording everyone.) But still enjoyable. And I miss them. Thrilled to hear the bells this morning. Magestic Saint Agnes can be seen over the fences of my backyard and I have missed their music. The complainers will just have to find something else to complain about somewhere else. The carillon is back, as it should be. Done deal. Sorry, but I am one of those complainers about the church bells. I live very close to the church and they are loud, distracting and quite honestly, annoying. Maybe a compromise can be reached? Hour chimes and carillon every 3 hours? i live around the corner, and attend mass at st. agnes. my family is relatively new to the area - but love the bells. I live roughly 60 feet from the bells and I love them too. Hope they remain. Sorry, but Brooklyn is known as the borough of churches. 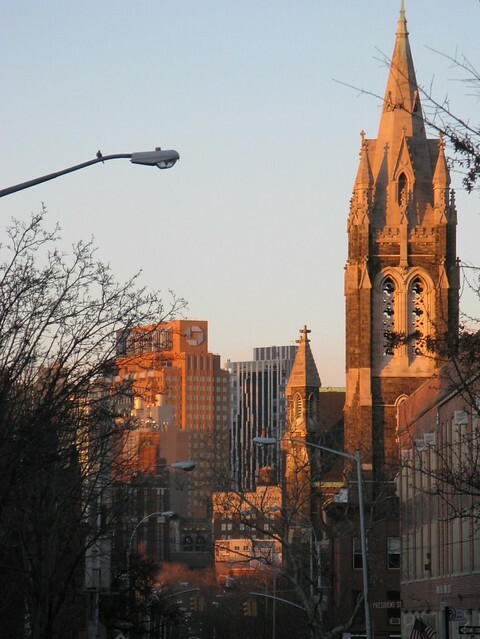 If church bells are so troublesome, I wouldn't live near a church, or I would eventually just tune them out like low flying jets on the flight path to LaGuardia. Parishioners supported the installation of the carillon decades ago, and then it went silent, purportedly because of "complainers." Bad move. As a child, I remember hearing bells from several neighboring churches chime the hours (depending on which way the wind was blowing), and no one complained, parishioners or otherwise. The original St. Agnes carillon chimed the "Angelus" at 8am, 12 pm, and 6pm daily followed by a hymn or a Christmas carol in December. It also chimed before each Mass. I thought that the Angelus schedule would have been reinstated, but the hourly strike doesn't bother me (I live one block away). The carillon is now restored as it should have been so long ago, and St. Agnes's parishioners are grateful. Fisheaters.com has a page describing the history of the Angelus Domini and the ringing of the bells. Listen to the beautiful YouTube video link on that page, as well. If anyone complains after that, then I truly feel sorry for you. WIth noise from helicopters and airplanes and sirens an every day occurance in our neighborhood, it's hard to believe that church bells are what people choose to expend their energy complaining about! Let's start a petition to keep the St. Agnes bells ringing! Lets hope it isn't a final hooray before the church is closed. The Catholic church was announcing many closings today. St. Agnes will not be closing. It was merged with St. Paul's on Court/Congress Streets a few years ago. St. Agnes and its carillon are here to stay. I think they are pretty but in moderation. Hourly is too much - and why do I want to be reminded that another hour has past? Once or twice a day and holidays, maximum, would be enough. The sound of the bells every hour on the hour is driving me crazy. I agree with a previous comment about a compromise. Hour chimes and carillon every 3 hours would be much better and tolerable than what they are doing now. "Sorry, but I am one of those complainers about the church bells. I live very close to the church and they are loud, distracting and quite honestly, annoying. Maybe a compromise can be reached? Hour chimes and carillon every 3 hours?" Response from a real Brooklynite: Sorry, but this is the Borough of Churches (pointed out by another poster). Perhaps you need to relocate to Maplewood. Re: ""Sorry, but I am one of those complainers about the church bells. I live very close to the church and they are loud, distracting and quite honestly, annoying. Maybe a compromise can be reached? Hour chimes and carillon every 3 hours?" Perhaps you need to relocate to Maplewood." Excuse me, but I *am* a "real" Brooklynite. Born and raised here for over 30 years and I love the fact that Brooklyn is the Borough of Churches. However, don't assume everyone who has grown up in here, in Carroll Gardens, has to like what was once common.